I just mailed back the contract for my twelfth play to be accepted by Pioneer Drama Service, The Purrfect Crime. And I couldn't be more thrilled. Loyal followers of this blog will remember this play as the one I developed with Palmer Ridge High School in Monument, CO. Which means that the talented cast and crew who gave the play its world premiere production will soon see their names in the published script. The Purrfect Crime is about a cat that inherits 42 million dollars after the death of the cantankerous Texas rancher who owned her. The rancher's spoiled children are appalled, and the oldest--a hard-driving businesswoman named Cecilia--immediately plots ways to get the fortune for herself. I think the play will do very well. Although it's not a farce in the strictest sense, there's a lot of physical humor and farcical elements in the plot. In fact, one showstopping scene features a pair of stupid criminals who pose as pet psychics, a case of mistaken identity that would feel at home in any classic farce. It's also my most female-heavy play. Of the ten speaking parts, seven are female, including the two leads. And it should be fairly easy to produce. There are no special technical requirements and, except for a couple of scenes that are played in front of the curtain, the entire play takes place in the living room of a Texas ranch house. JANICE: (Reads.) "The last will and testament of Robert 'Big Bob' Little." ANNIE: Can you hurry up? ANNIE: I know, but I was hoping you could skip to the part where I get everything. JANICE: Please. Be. Quiet. (Clears her throat.) "As we grow older, we come to realize that money really doesn't matter—"
CECILIA: I'm not that old yet! ANNIE: I hope I never get that old! JANICE: "What matters is the love and devotion of those closest to us. Therefore, I leave everything I own to the one member of this family who has shown me nothing but unswerving devotion and love..."
ANNIE: I can taste those millions now! CECILIA: What did you say? JANICE: I said Wiggles. Wiggles gets everything. ANNIE: I think it's the cat. DIGBY: Oh, it's most definitely the cat. CECILIA: Uh huh. And when it says "everything," what exactly does that mean? CECILIA: You mean like the cat bed? ANNIE: Oh, the cat food! JANICE: No. It means everything! LITTLE BOB: Wow! Even the cat toys? JANICE: Let me see. How can I put this? Wiggles gets everything. The house. The land. The 36 million dollars in the bank. It all goes to Wiggles. ANNIE: That's not fair! Wiggles is just a stupid animal! JANICE: How can you call her stupid? I thought you loved animals. ANNIE: I do. As a concept. It's real animals I can't stand. Today I got a call from Candace Coster, also known as Candace Hilligoss, star of the 1962 cult horror film Carnival of Souls. No, we didn't talk about old horror films (though I would have loved to!). 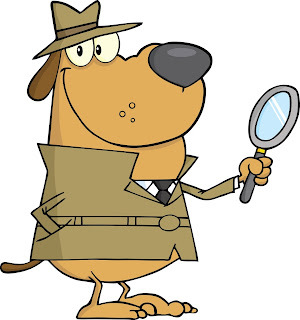 Candace called to tell me that my full-length comedy The Bow Wow Detectives won the Beverly Hills Theatre Guild Play Competition for Youth Theatre, also known as the Marilyn Hall Award, for which Candace serves as organizer. It's the third time I've won in the last four years. Rumpelstiltskin, Private Eye won in 2014 and How I Met Your Mummy won in 2015. Last year, The Last Radio Show got an Honorable Mention, and the judges said it probably should have been entered in the adult category. I feel extremely honored. And I have to chuckle, because the win demonstrates, more than anything else, the subjectivity of humor. The Bow Wow Detectives didn't win a thing in four other contests I entered it in, and it's been rejected by two publishers, including my regular publisher, Pioneer Drama Service. But the kind folks who judge the Beverly Hills contest thought it was hilarious. The award doesn't include a production, but it does come with $1200 cash, one of the biggest youth theatre prizes out there. And I'm looking forward to attending the awards luncheon at the Beverly Hills Four Seasons Hotel in March. I wasn't able to make it the first two times, but now that I live a mere six hours away, it's much easier for me to get there. The most important benefit of the award, however, is the breath of life it's provided. I 'd almost given up on the script, but now with this vote of confidence, I'll be brushing it off and sending it out to other publishers soon. By the way, I'm still looking for some school or community theater to give the play its world premiere. If you'd like to me to email you a no-cost, no-obligation script, email me by clicking here. 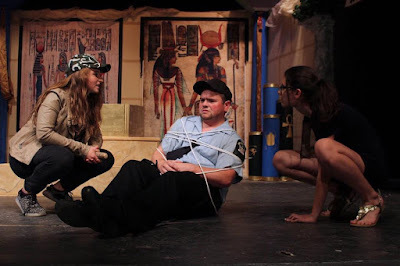 A big shout-out to the Sullivan County Dramatic Workshop of South Fallsburg, NY and to the talented individuals who took home TANYS (Theatre Association of New York State) Awards for their recent production of How I Met Your Mummy. Kristopher Rosengrant received a Meritorious Achievement in Acting for his performance as that knee-knocking, lily-livered security guard Melvin (see above). Harold Tighe and Jim Schmidt received a Meritorious Achievement in Set Design and Construction for their colorful, artistic take on the O. Howe Dulle Museum. And Dawn Perneszi and Jenny Silverman received a Meritorious Achievement in Costume Design and Construction for their simple yet pitch-perfect costumes.